For the longest time I had been meaning to start my own blog as a way to jot down my experiences and thoughts on bees and beekeeping. Several months ago I finally did so. 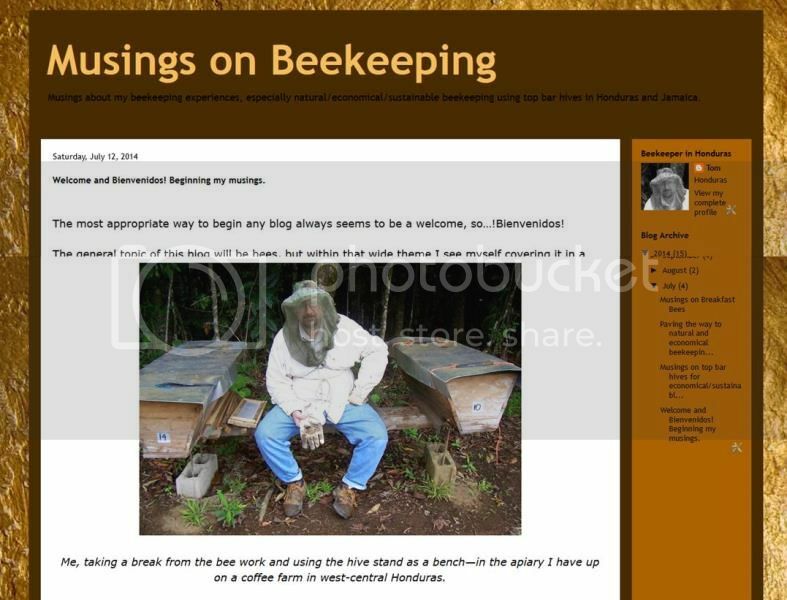 Check out my blog, “Musings on Beekeeping,” beginning with my welcome post. Most of my beekeeping has been done in Honduras—that’s where I got my start. This means that many of the blog entries will probably deal with my beekeeping here in one form or another. But I’ve also had the opportunity to work with commercial beekeepers in Wisconsin for several years and more recently with a beekeeping training program in Jamaica during three month-long stints. My beekeeping in Honduras and the trainings in Jamaica have been primarily with top bar hives while the commercial beekeeping in Wisconsin was with Langstroth hives. I start most of my hive by catching swarms and I build much of my own equipment. My beekeeping in Honduras is with Africanized honey bees while in Wisconsin and Jamaica it was the European honey bee. I’ve also been able to deal with stingless bees a bit. So my experiences are varied and it has all been getting mixed together in the blog. I also have a companion blog with these same entries but in Spanish, “Reflexiones Sobre Apicultura.” This was started more recently and is still missing some of the blogs from the English version. Little by little I will get it caught up to the other. I hope you enjoy them and I welcome your comments.